Lobbyist for Wheelabrator confirms he was not registered with the Ethics Board. Budget Office says the bill will cost the city tens of millions of dollars. One of the most heavily lobbied issues to hit City Hall in a long time is set for a showdown tonight, with a City Council vote scheduled on a bill that would require Baltimore’s trash incinerator and medical waste incinerator to reduce their emissions of harmful pollutants. The last time partisans worked a bill this hard in City Hall? In recent weeks, Wheelabrator Baltimore has unleashed a torrent of full-page ads, social media messaging, robo-calls and printed mailers to defeat the measure. “Today alone I got four different flyers from them, in addition to the one I got last week,” said Amy Stump, who lives in the city’s Hunting Ridge neighborhood, speaking recently with The Brew. “All the money they’re spending, they could use it to upgrade the plant,” Reisinger fumed. Focusing on the company’s efforts to kill the bill, Councilman Zeke Cohen says Wheelabrator is violating the lobbying law he pushed through last year by failing to register its City Hall lobbyist. Richard A. Tabuteau’s name was not on the list of registered lobbyists for 2019, records on file with the city’s Ethics Board show. That caught Tabuteau, who formerly served as a senior advisor to Maryland Lt. Governor Boyd K. Rutherford, by surprise. The other facility impacted by the bill, Curtis Bay Medical Waste Services, has hired three attorneys from Harris Jones & Malone to oppose the measure. The firm, headed up by Lisa Harris Jones, is registered to lobby on the issue. “It’s incredibly important that the public understand where all the information is coming from so they can make an informed decision,” Councilman Cohen said. The words “a project of Wheelabrator Baltimore” appear at the bottom of its homepage. The Wheelabrator incinerator has been in the crosshairs of neighborhood and environmental activists for years. 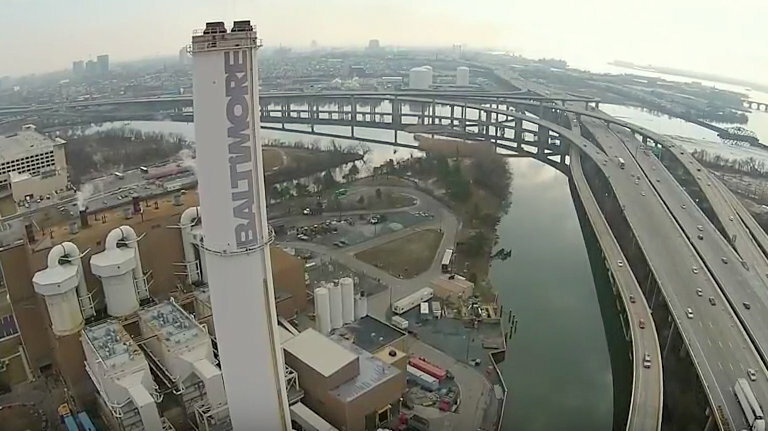 The 34-year-old facility is the biggest source of industrial pollutants in Baltimore mainly due to the large amount of nitrogen oxide (NOx)it emits. NOx is known to increase ozone in the atmosphere and worsen respiratory conditions such as asthma, a major problem in parts of southwest and south Baltimore not far from the plant. Bill 18-0306, which would require the two facilities to significantly reduce emissions of many pollutants and require constant monitoring of emissions, is up for a final vote tonight. Reisinger said he still believes he has the votes to pass the measure, which would then go to the mayor for her signature or a potential veto. The last-minute lobbying has focused on cost estimates by the budget office meant to show the fiscal impact if Bill 18-0306 passes. A report says the city would have to spend $98.6 million over seven years to send trash now burned in the incinerators to the Quarantine Road Landfill. It says sending trash outside of the city could cost as much as $73.6 million. Supporters of the legislation said the estimates are off-base because they assume the Wheelabrator facility would shut down immediately upon the law taking effect. The company’s contract with the city is effect until 2021. And the tougher pollution limits specified in the measure would not go into effect until the following year, 2022.